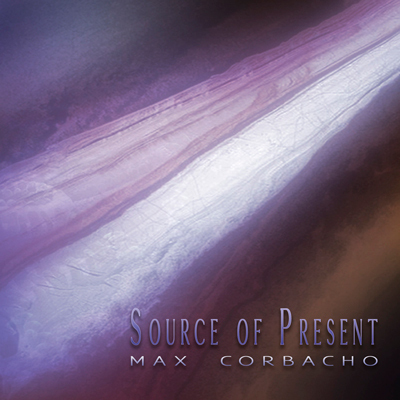 Space ambient of the first order from Max Corbacho, who has been crafting deep, atmospheric soundscapes for the better part of two decades. Much has happened since his debut Vestiges appeared in 1998, including an ongoing refinement in the sound design of his ambient productions. Created during 2015 and 2017, Source of Present finds him in fine form, never more so than during the seventy-four-minute release’s opening track, “The Beginning of Remembering,” an oceanic, self-contained universe that ebbs and flows for twenty-four dramatic minutes. Exploiting the potential of looping, reverb, processing, and sequencing in his productions, Corbacho sculpts deep soundworlds that radiate and shimmer in largely serene manner, though there are moments where the material assumes a dark and mysterious aspect. Synthesizer-generated waves of crystalline sound overlap, building into resonant, harmonious wholes that often reverberate like some primal force. In meditative fashion, the music unfolds with patient deliberation, Corbacho content to allow the material to blossom like some natural phenomenon rendered at half-speed, and likening its effect to a state of deep slumber isn’t unwarranted. While it is characterized by organic flow, it’s not static: sixteen minutes into “The Beginning of Remembering,” for instance, a noticeable rise in intensity and volume introduces an ominous element of foreboding into its otherwise starry-eyed presentation. As dynamic as that opener is, the subsequent “Soul of the World” and nineteen-minute title setting swell even more dramatically, their epic expanses suggestive of exploding star clusters. Ambient music’s often characterized as time-suspending and Corbacho’s is no exception, especially when the Spanish electronic artist’s taste runs to long-form immersion. It’s easy to get swept up by his soundscapes, so much so that as the recording plays the immediacy of the physical world with all its distractions and noise falls to the wayside. Is there anything here the ambient aficionado hasn’t heard before? Probably not, to be honest, but if your appetite for deep space ambient is insatiable, Source of Present shouldn’t be overlooked. Corbacho certainly does it as well as anyone.